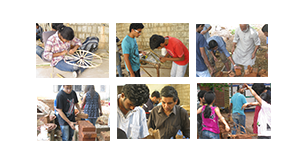 The University School of Design (USD) was established in the year 2002 as a self-financing institution under the aegis of the University of Mysore. The University of Mysore aspires to become a world class University by tapping human potentials from all sections of society towards excellence and building human capital. The vision of the School is in tune with that of the University which provides an ideal environment that kindles and catalyzes the creative talents of students to fulfill successfully the professional responsibility of serving the society. To enrich the educational experience of students and empower them to develop meaningful career and life goals. To perceive Architectural Design, as a comprehensive creative process. To create multi-disciplinary courses and integrate live projects into design studio. The University of Mysore was set up with this noble vision by the far-sighted ruler of Mysore, Sri Krishnaraja Wadiyar IV, who was known as the pious king, ‘Rajarshi’ and Sir M.Visvesvaraya, Engineer-Statesman, on 27th July, 1916. The University has given birth to four universities—Bangalore (1964), Mangalore (1980), Kuvempu (1987) and Karnataka State Open University (1996). It has been accredited by NAAC with five star status (2000) and reaccredited at A+ level (2006). It has also been identified by Government of Karnataka (2009) as an Innovative University. ` It has been recognized by the Government of India as an Institution of Excellence with an award of a Centre of Excellence in Biodiversity, Bio-prospecting and Sustainable Development (2008). Produced more than Two Hundred graduates, and forty post graduates. I am happy that the school is organizing zonal NASA Convention. It is setting that the school is also bringing out a "souvenir" on the important occasion which will be a handy educative tool to all. I congratulate all the faculty members, supportive staff and students of School of Planning and Architecture for their commendable performance and wish them success in all their future endeavours. "The ‘personality’ of this school differs from all other Architectural Schools of the country. If I venture to understand the reason, I infer that I see God in all the students and I firmly believe that they can reach great heights observing their dedication to their studies. We facilitate their steadfastness."